I've been asked many times about why I put my thoughts and my life on display in a blog for other people to read and I gave my answer to that a few weeks ago HERE. But there is another reason for writing this blog, one I've only just come to recognize and acknowledge. And this other reason is that my blog has given me my voice. People who know me would say that I have a voice that is loud and clear (sometimes too loud and clear!) and in some aspects they would be right about that. I am quite vocal and I do enjoy a good discussion/argument/interaction. But, at the same time, my voice has been controlled by others for most of my life. When I was a child and a teenager I lived in a home that revolved around my father and his wants and needs. What we thought or felt was of no real interest and we certainly never got a say in how life played out. My brother tried by rebelling and being a bit of a hellion through his teen years, but I wasn't that type of person. I was the oldest child and I minded my manners and never really found my true voice. I remember my parents deciding to move house in the middle of my senior year in High School because it suited them - I had no say (except to breathe a sigh of relief when our house didn't sell). I remember wanting to go to university and being told "girls don't need too much education". I remember leaving home as soon as I was old enough because I wanted to be seen and heard in my own right. A few years later I married into a lovely family who had very strong Christian values. I wanted to be accepted into this family and I moulded my personality and my voice to fit into how a good Christian wife and mother should sound and behave. I failed many times because it's hard to fit a square peg into a round hole - you keep banging it in, but there are often splinters and cracks. I wanted to be that lovely, genteel, kind and compassionate woman of biblical proportions, and tried to keep my voice down and toe the line. I did quite well for most of it but there was someone inside me who just wanted to be recognized for her true self and to be accepted for who she actually was. Roll on into Midlife and that little voice has gotten louder. Upheavals happened and the voice got even louder. Now I listen to that voice and I'm honest about who I am - the person I've earned the right to become. 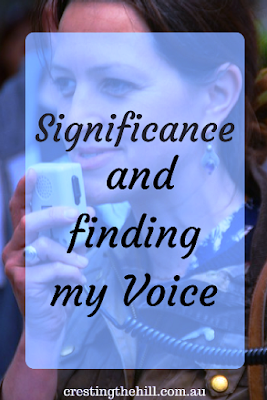 My blog lets me speak and take ownership of my right to have a voice and to be a less than perfect person who still has significance. Sometimes I still feel the pressure from others to pull my head in and toe the line. To be the "nice" middle aged woman who steps back and doesn't demand anything. Sometimes I think "maybe I should be that person because it would be easier" but I don't really want to lose myself again. I want to stretch out and not be squashed. I don't want some 'young thing' or some old biddy telling me I shouldn't say something, or write something, or be something. Surely this is my time to step forward and not have to apologise for who I am any more. So many younger people appear to have picked up their significance and self-worth by osmosis. I didn't seem to absorb mine anywhere in my younger days, but now it's seeping in and wanting to speak up and speak out. I really like having a voice, I like saying stuff that resonates with other Midlifers, I like having my blog and my space. I don't think that's too much to ask for after 50+ years of minding my P's and Q's. I've come to see that for me it's not necessarily about being "Loud and Proud" it's about being "Real and Glorious" (to quote my blogging friend Diane) and who wouldn't want to be real and glorious?! Far better to be using your voice now than never. I say go for it. Too many people have obviously been placing you into roles that were not the right fit and now you are finding this for yourself. I was fortunate to have a father who valued education and as someone quite a bit older than you (67) I worked in a full-time role in K-6 Education, married and raised a family of two kids. I will never say it was easy but I was a happier person being in the work environment I loved. Dad still tells me he is glad he encourage me and my brother to pursue careers. Mum never worked and never quite 'got me' but she did support me by helping out where she could. Thank you for linking up for #lifethisweek 23/52. Next week: Public Holidays. Thanks for the encouragement Denyse - I think having parents that were supportive of female tertiary education in the 60's and 70's was a huge boost. I wish mine had been a bit more on board with the idea, although I still managed to further my studies and have a career, it was probably not the field I would have chosen if I'd been given more scope. It's nice to be in charge of making my own decisions these days - and being able to speak about it with others who understand. I have always been outspoken and made no apologies. I've been criticized for speaking out on sexism, even by other women. I used to think that when my generation was gone things would be different for women, but we still have a long way to go. It's slowly changing Denise, but I think it will take the next couple of generations to find the balance - it's about speaking up but not shouting others down and that's so difficult to get right when you've felt stifled. Well done! I felt drawn to write my story for many of the same reasons you stated. It's a wonderful story and I wanted it to be in my voice. I've gotten a few raised eyebrows and lack of interests, and who cares! Those that love me tell me that it's my story, in my words, and there's no need to look for input from anyone else. Keep moving forward, Leanne! Thanks so much Mary Lou - it's funny how we reach a stage where we want to tell our story and sing our song and be heard by those around us. It has snuck up on me but now that I'm in that place, I don't want to go back to constantly muffling myself. Real and Glorious is great! I for one certainly don't want you to shut up any time soon! What a lovely thing to say Haralee - thank you so much! 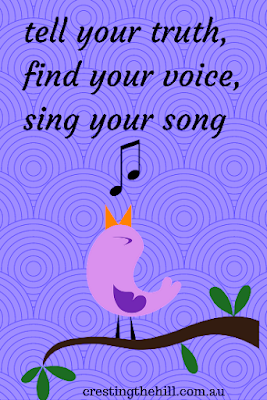 I don't think I'll be silencing myself as often anymore - I have found this wonderful world of Midlife friends who are doing life on the same path as me and sharing the journey is amazing. It's never too late, never. And you're right about developing voice - the vocal and the written - as you write and become acquainted with your strongest thoughts. I love reading about change like this; I especially appreciate how you're analyzing things as they happen. GO, you!! Thank you Susan - you say things in such a profound way - it often clarifies what is zooming around in my head - and you're so right about writing to become acquainted with those thoughts that have been boxed away for too long. It's such a sense of freedom to discover what's hidden away. 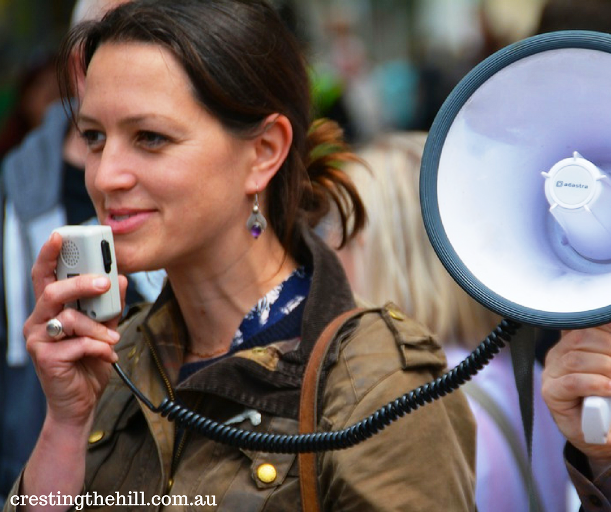 Hi Leanne - I love the idea that your blog is a tool to help you find your own voice. I think I feel the same way about mine. While I find I dislike some things about aging, finding and expressing my own voice is one of the best parts! Renee I so envy women who had parents who were ahead of their time. My mum says she had no idea how "under the thumb" she was until recently (and she's in her mid 70's) I'm so glad I discovered my voice now and not in 20 years time. The generations to come will be telling it as it is from birth, but for me it's taken some time to catch up with everyone! Leanne, What a great way to put it. Yes, many of us bloggers are actually quiet people who use writing as our way of "talking" to the world. I'm glad you found your voice. Love your blog. 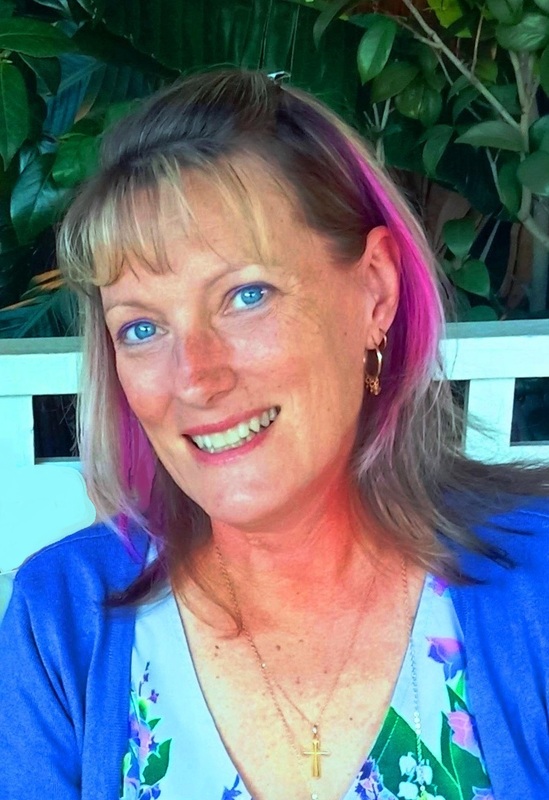 Thanks so much Laurie - so often I see similarities in our journeys and that's what I love about blogging - that connection and affirmation that I'm on the right track. To be able to "speak my truth" and not have to adapt it to the people around me is such a release and I never want to go back to the way things were. That's great that you found your voice! I find it much easier to say what I want on a blog, than face to face. Thank you very much for sharing great things to help us to create a positive attitude to possess with life. Real and glorious sound so much nicer doesn't it Leanne. I too took until 50 to realise I did have a voice and now almost 10 years on I'm enjoying my freedom in being me. Love your new website - it is always exciting and motivating to change it up a bit isn't it?